What a wonderful way to use leftover turkey that is delicious and an easy lunch. The turkey can easily be replaced with leftover chicken. Ingredient amounts will make 4 sandwiches as shown. In a large bowl whisk the Miracle Whip, poultry seasoning and pepper. Add the diced turkey, bacon, celery and cranraisins and fold together until evenly coated with dressing. Toast bread and evenly divide the mixture and place onto toasted bread. 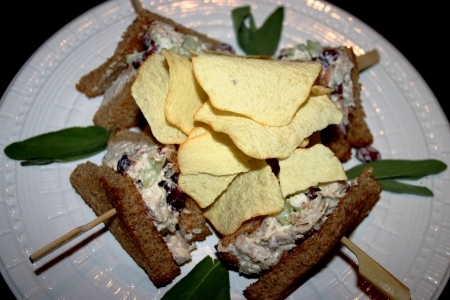 Top with second slice of toasted bread, cut, insert toothpicks if using and serve with chips if desired.